This volume presents the results of a project realised within the research programme Research at Museums (forMuse). Selected objects from the collections of the Austrian research traveller and collector Hans Leder (1843–1921), which are located at the Weltmuseum Vienna and other ethnographic museums in Central Europe, are reunited here for the first time. These are primarily Buddhist ritual items of daily life in northern Mongolia around 1900. 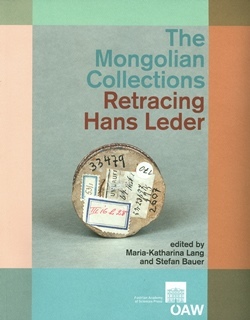 Following an introduction to the history of the collection, with numerous original quotations by the collector, and historic and recent insights to Mongolian Buddhism, specific object groups are presented and described. An illustrated section within this appealingly designed book shows as yet unpublished object photographs that were taken during the project. The volume brings together descriptions of artefacts from multiple points of view. The interdisciplinary project team thus provides a new approach to a collection of Mongolian art which is unique in its abundance and authenticity. With contributions by Ágnes Birtalan, Olaf Czaja, Béla Kelényi, Maria-Katharina Lang, Lhagvademchig S. Jadamba and Krisztina Teleki.